The AV325B "ref" is by far the biggest triode I laid my hands on! This is a real "powertriode" with its 75watts plate dissipation and 27watt RMS output... Ofcourse it has to be run hot to achieve these specs and that is something that I'm not fond of unless really neccesary. When doing this you'll have to design a really heavy powersupply because the 325B can deliver an amazing plate peakcurrent of 1.5Ampère!! To be able to deliver this, a filament current of 2.6Ampère at 5Volts is no surprise.. The tube is pin-compatible to the 300B, and will run at 300B specs, but be sure to check if the filament voltage will not drop below the 5Volts or, worse, if your powertransformer can handle 2.6Amps and will not go up in smoke due to almost twice the current! The 325B has a slim design, starting straight from the socket ending in a traditional ST-shape ("Shoulder Type"). To be able to dissipate the full plate power, Alesa Vaic has made (and patented) a new alloy called NiXX-Block. This material has a lowered "intermodulation distortion" which means as much that at higher dissipation the finer details in music will not disappear. The plate is relatively big and has grooves for rigidness and extra cooling. Also the cathode is slightly different than in his other tubes: again a new (patented) material is used which is called "TSE hard metal cathode"?? Again the filament is said to be made from "unbreakable" material as with any other AV-tube. To be concise: A tube which really invites to listen too!! Adjustment. Since I use a BlackGate WKZ in my powersupply I had to stay beneath the 500Volts as advised by BlackGate... A typical adjustment for the 325B is a B+ of 550V at 130mA. This is done using a separate bias-voltage. I couldn't find any curves of this tube so I had to "guess" for an adjustment below the 500Volts with fixed bias. At first I tried a typical 300B adjustment which should be safe as this tube is compatible to the 300B. I normally use the TJ300B at 375Volts at 60mA using a 1K cathode resistor. I increased the B+ to 475Volts and left the 1K cathode resistor. The AV325B settles quickly to a mere 80mA, which is almost peanuts for this tube (looking at the max. specs). This means a plate dissipation of almost 32watts. Alesa Vaic assured me that at lower dissipation this tube would also sound good, so I let it play for about 4 days. After that I tried increasing milliAmps by decreasing the cathode resistor's value but couldn't hear any difference except for somewhat increased output power..
Sound. We call it "PowerTower"! What an authority! Power! Control! It is almost like this tube has its hands around my speakers' throat: "Do not dare add sounds yourself!!" Really impressive! From its UX4 socket the AV325B rules... 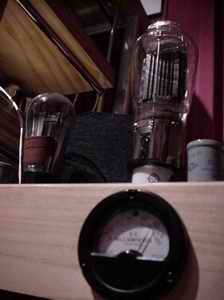 Especially in more complex music like rock, electronics and classical crescendi this tube is a winner! It is almost like Alesa Vaic built in a mosfet in the tube-socket just to fool us all.... I've built several different push-pull amplifiers and must say that power is almost alike these amplifiers. Just ooohs and aaahs?? No, unfortunately details are not that "crispy" as with the TJ, despite the use of NiXX-Block... Maybe the benefits of a meshplate... So along with authority and power some "flair" at low level details are lost. Mind me, this is subtle!! Conclusion. The AV325B is really the top and I can recommend this tube to anyone! I also see an opportunity for all owners of hard-to-drive speakers too finally hear what Single-Ended is all about!